What’s next? The Baby Boom generation is everywhere. As a child of the 60’s I’ve often had mixed emotions towards them – annoyance at how much attention they get combined with gratitude that they cause so many changes that I will benefit from in the future. One of those changes is happening now in the appliance manufacturing business. As boomers age, they are increasingly staying in their own homes and have the income to modify those homes accordingly. Appliance manufacturers want to get a piece of that. According to the Wall Street Journal, changes are being made. In the kitchen, General Electric Co. is designing ovens with easier-to-open doors and automatic shut-off burners. A joint venture of Germany’s Bosch and Siemens AG has introduced a glass cook top for its premium Thermador brand designed to prevent boil-overs. Minnesota-based Truth Hardware reports booming sales for its remote-controlled window motors. “This population is far more demanding and will refocus designers” on individual consumers, says Joe Coughlin, director of the Massachusetts Institute of Technology’s AgeLab, which studies design and engineering for an aging population. Among appliance makers, Whirlpool Corp. has long tested products with potential customers who are deaf, blind or arthritic. The testing with arthritis patients helped prod the Benton Harbor, Mich., appliance maker to offer pedestals that raise the height of washing machines and clothes dryers for customers with back problems. 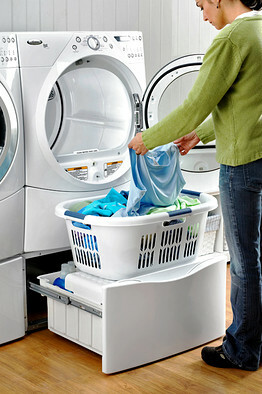 A pedestal beneath this Whirlpool dryer reduces stooping when removing laundry. Whirlpool also offers washing machines with large knobs that make louder-than-usual noise when they’re set, for customers with limited vision or arthritis. “It’s not one of those little prissy knobs,” says spokeswoman Audrey Reed-Granger. One model introduced last year plays musical chimes to indicate washing temperature or other features. At GE’s consumer and industrial headquarters in Louisville, Ky., designers use “empathy sessions” to help develop new refrigerators, stoves and dishwashers. Industrial-design intern Joanie Jochamowitz, 22, wraps her knuckles with athletic tape and wears blue rubber gloves to simulate arthritis. She shoves cotton balls in her ears to simulate hearing loss, dons special glasses to simulate macular degeneration and puts dried corn kernels in her loafers to simulate aches and pains. She grabs a walker. Then she tries to peel potatoes. “I don’t want to get old,” she says, as she hobbles around the kitchen, fumbling with potato peelers and stove controls, and nearly spilling a pot of boiling water. GE began the empathy sessions last year so its young designers could better appreciate how consumers use appliances. “When you’ve got designers that are 25 or 30 years old, it’s very hard for them to understand what someone in their 60s or 70s experiences,” says Kim Freeman, a spokeswoman for GE Appliances. The company also arranges focus groups where consumers cook a meal in a GE model kitchen while staffers watch through cameras and one-way mirrors. And GE videotapes appliance users in their homes. The summaries from these tapes are used in brainstorming sessions about design changes. “We note what they are doing. We see if those behaviors happen more than once and why,” says Marc Hottenroth, industrial design leader for GE’s Consumer and Industrial unit. These efforts have prompted several changes in GE product designs, including brighter LED lighting that improves visibility inside new models, such as one with a French-door refrigerator atop a bottom freezer. This year, GE introduced a single-wall oven with two cooking spaces that can operate at different temperatures. Its research shows boomers cook and entertain more frequently and like the two-ovens-in-one concept. Some models can be raised off the ground for easier access. “You don’t have to reach in as far,” says Ms. Freeman. She says it prevents people from stooping awkwardly, losing their balance and burning themselves on the hot stove. GE has new dishwashers and washing machines that allow users to put in an entire bottle of detergent a few times a year rather than a smaller amount for every load. The machines are designed to reduce confusion and make housework less of a chore, particularly for older consumers. 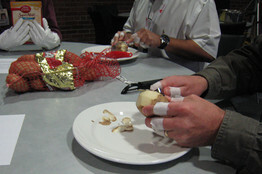 At an ’empathy session,’ members of a GE product-development team tape their knuckles to simulate impaired dexterity. Appliance manufacturers hope these design changes will buoy revenue. Sales and profits in the U.S. appliance industry are down this year because of the housing bust, the stock-market slide and the economic slowdown. But for the long term, the appliance industry expects big returns because of baby boomers and hopes of a housing rebound.